I feel safe in saying there are few places in the world where two anglers could catch a combined length of almost 1000 inches of channel catfish in roughly 10 hours of fishing. 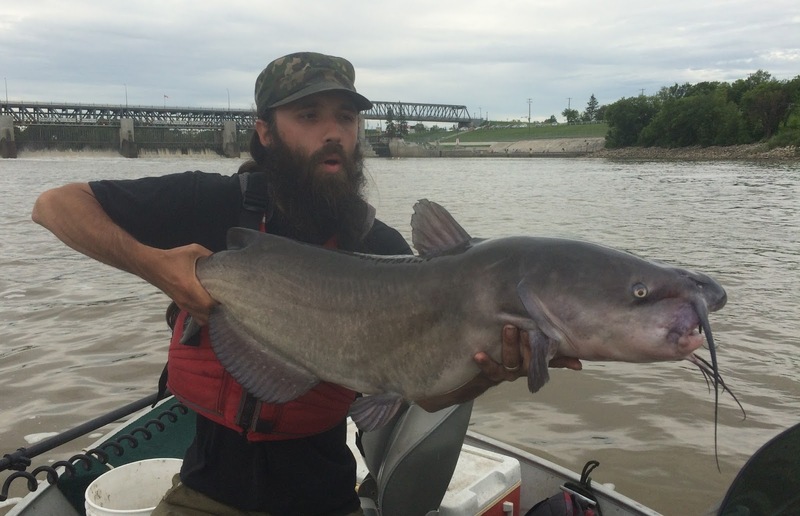 My number one spot to try would be the Red River in Manitoba, starting at Lockport and moving north as needed. 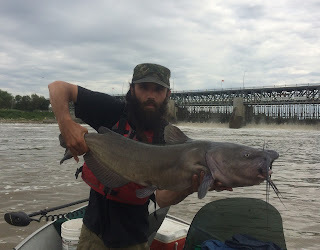 We set off in hopes of reaching the 1000 inch goal we had set for ourselves the other day and it ended up being the best trip on the boat this season. On the road by 5 and at the launch by 7:30, we were the second boat out and heading to the locks. It wasn't long before we saw some nice arcs in a deeper pocket on the Lowrance screen so we headed a little further upstream to anchor up and toss some bait down to them. It's been a wet spring and summer so far with Manitoba barely going a few days without a good storm. The levels on the Red were high, but it was clear by the debris line on shore that it had receded a meter since the last storm surge. Pelicans were hunting in the new "Pelican Protection Zone", cormorants sailed the heavy current diving successfully for small goldeye and the occasional eagle would soar over head riding the thermals. Jay put the first fish in the boat early on, but we didn't get another bite for 15 minutes after that so it was time to pull anchor and make a small move. After re-positioning the boat and casting out a fresh piece of cut bait, I got a bite in under 5 seconds and the battle was on. I love fishing for catfish big or small and when you have a big one hooked near strong current, the battle intensifies. 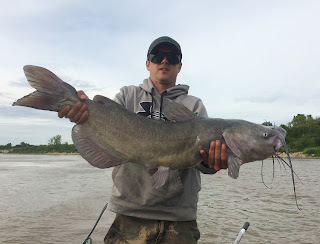 The clarity was absolutely ZERO and the only indication the fish was near the surface would be a big boil or the swivel 16 inches from the hook instantly appearing. We proceeded to land 8 catfish over the course of an hour or so from this spot before the bite died off. A quick spot change and we were right back at it! 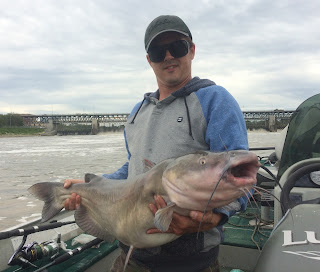 Cast bait, get bite, set hook, gain some line back, lose some line, gain some line, lose some line, heave, pull, net, unhook, measure, picture, release. It was around lunch when we realized we were well on our way to the 1000 inch goal. It's worth mentioning the not so pleasant odor of laundry detergent that surrounded us as mass amounts of froth and suds were constantly floating by. The phosphorous over load on this watershed is clearly evident, especially after storms, and it will take more than just the choices and lifestyle decisions of Manitobans and the surrounding states and provinces to remedy this. It is an easily dismissed problem that can become even more so evident with the satellite imagery of the algae blooms on Lake Winnipeg. Hopping from spot to spot as needed, we would put a few catfish in the boat from all but one that we tried. Arms sore, bait severely depleted and tackle tested, we had to be home for prior commitments and were forced to leave after 10 hours of fishing. 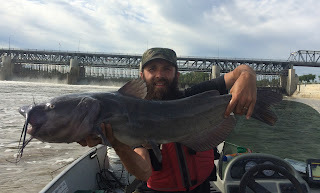 In total 28 catfish were landed with 18 over 34 inches and only one under 31 giving us an average size of just over 34 inches and a total length landed of 953.5 inches. We didn't quite reach our goal but we had one heck of a good time trying and are confident our next attempt will exceed the 1000 inch marker. Hopefully this can bump your views up a bit. Let me know if you would like me to take it down. 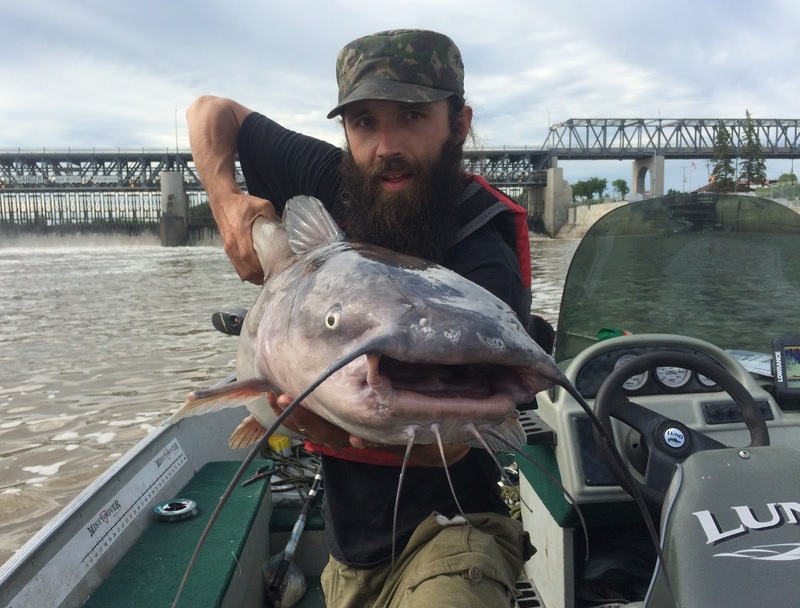 Beards and Catfish, what could be better!